← A demotion? No! Not at all! With the various studies in school environments, one must wonder why classrooms are mostly square! Transforming the square box into an inviting area to spend a few hours is tricky! Unbecoming … how to fix this?!? during the school day. 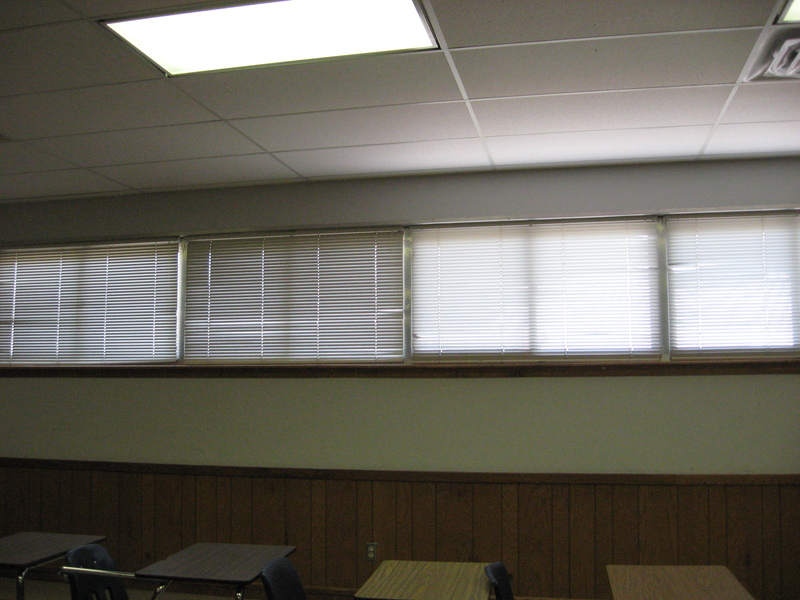 So after studying the only example I could find in other classrooms at school, I realized that I could staple cloth just above the window … creating a valance look. But I didn’t want to spend much money or have to sew! So … I’ve decided to hang bandanas … yep … that’s right … they will hang a little more than a third of the way down the window. I can staple the bandanas along the top edge … and cover the stapled edge with ribbon to give it a finished look! I can’t wait to work on this project … only I have a small problem! My less than 5 feet of height prohibits my reaching the top of the windows! I’m not sure I can haul a ladder upstairs to my classroom. So I’m looking for a tall handyman … someone who has a flexible hour or two … to overcome my height disadvantage! As soon as I find this rescuer, I’ll take pictures of the finished product. As an administrator I had a lovely office. It was furnished nicely by the district. I had a bookshelf or two, a cabinet, comfy chairs … it was easy to decorate once … and the decor was good for all the years I worked there. As a teacher, the classroom must be decorated every year! And decoration isn’t just identifying the color and texture of a few objects. Instead, decorating is all about creating atmosphere, establishing movement patterns, and creating effective, efficient work areas. Teachers all across the nation are scouring favorite shops for just the right “do-dad” to create inviting learning spaces! Teachers are interior designers before they can be learning architects! This entry was posted in Math at School and tagged classroom, decor, school. Bookmark the permalink.